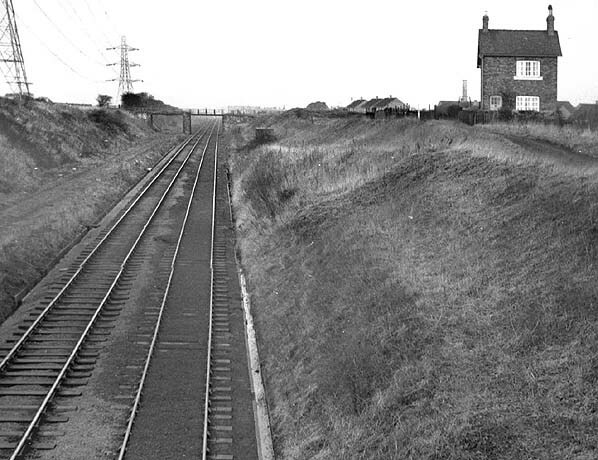 Notes:This station opened with the Seghill – Percy Main route. It was presumably rebuilt when the gradient-easing engineering works were carried out in the 1850s. The 1864 OS map indicates a building east of the track with a short approach road from the south. 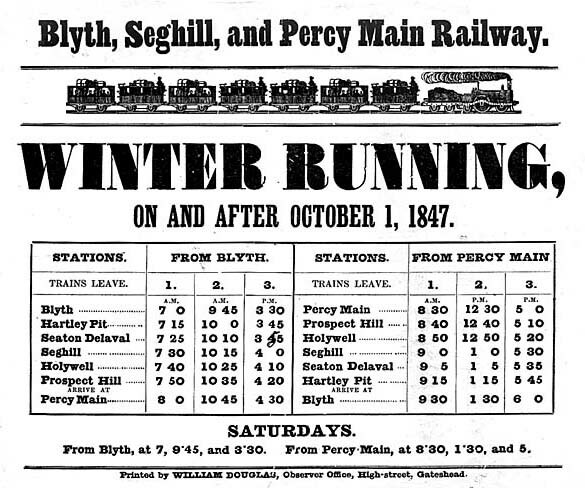 The station closed when trains were diverted from the Seghill line to run to New Bridge Street (Newcastle) via Jesmond to Tynemouth. BS & PMR timetable from CJ Dean, 1863 Bradshaw from Alan Young. Route map drawn by Alan Young..
To see other stations on the Blyth & Tyne Railway Percy Main - Blyth, Morpeth & Newbiggin line click on the station name: Percy Main (B & T) 1st site, Percy Main (B & T) 2nd site, Backworth Colliery, Backworth (1st site), Seghill, Seaton Deleval, Hartley Pit, Hartley, Newsham, Blyth 2nd site, Blyth 1st site (on branch), Bebside, Bedlington, Choppington, Hepscott & Morpeth B & T.
The site of Prospect Hill station looking north-west. Only the interruptions to the gradient of the cutting give any clue that there was ever a station here. 1861 1:2500 OS Map. The station building can be seen to the north-east of the single track, with a siding to the north, and a short approach road from the level crossing, on what is now New York Road. The rural setting is evident. Apart from the hamlet of Prospect Hill (just off the map, to the north-west) and the Allotment (the village seen immediately to the west) the station also served a small coal mine, known as John Pit (at the north-east corner of this map). 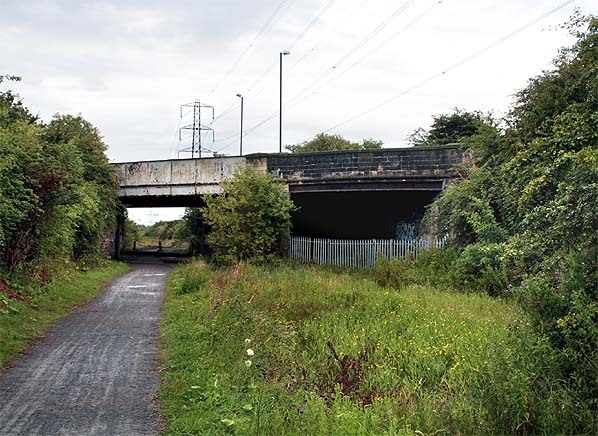 Parallel and adjacent to the Blyth & Tyne line are the double tracks of Cramlington Waggonway. Prior to opening its own route the Seghill Coal Company used the Cramlington Waggonway to carry its coal to the River Tyne for export. Looking south-east along the trackbed towards the site of Prospect Hill station. 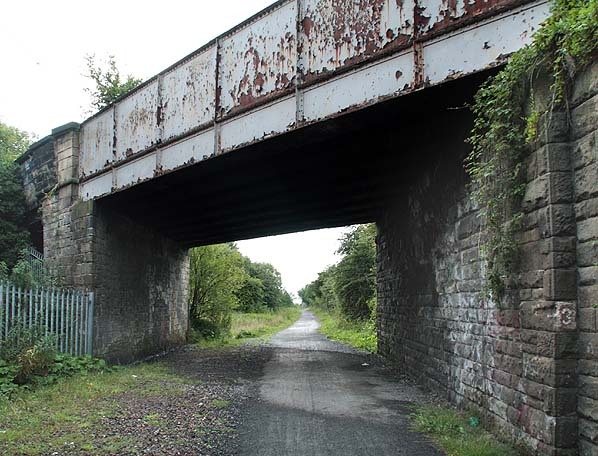 The platform would have been in the bushes on the left, with the station building probably midway between the photographer and the bridge in the background which carries New York Road over the railway. 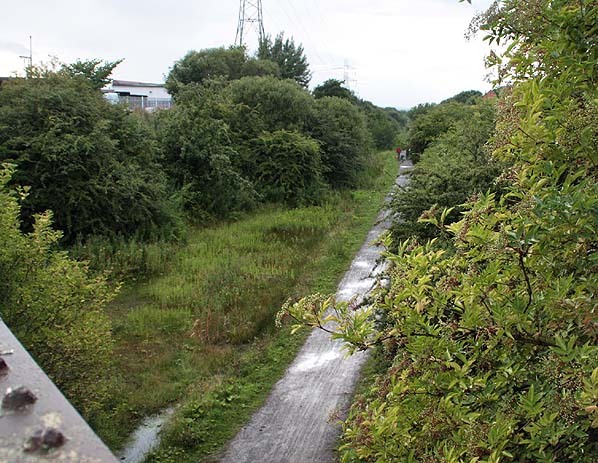 Looking north-west from New York road bridge in August 2008. The site of the station is hidden by the bushes on the right. Looking north-west along the trackbed towards the site of Prospect Hill station in August 2008. The platform would have been in the bushes on the right on the far side of New York Road bridge.